Here is how I would do this: You have your pattern (val-file) and a measurement file (vit-file). You need the measurement file with your sisters measurements. 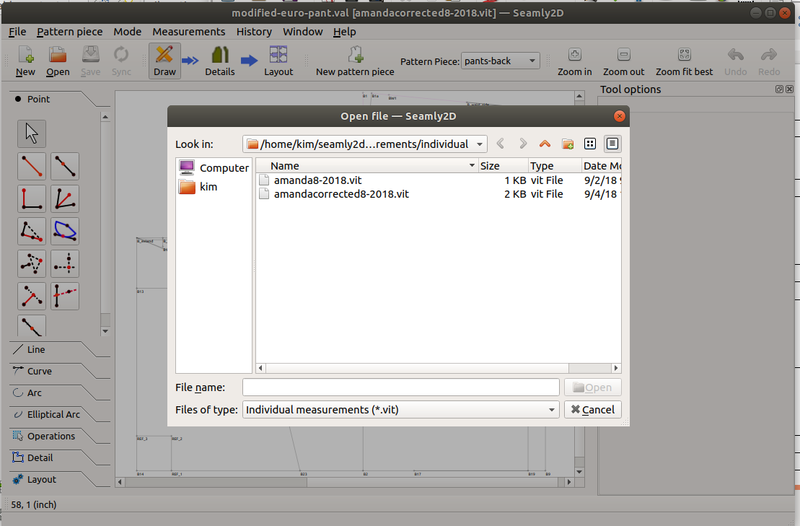 (open SeamlyMe --> file --> create from existing --> select your measurement file, then input everything and save) Then in Seamly2D you load the file with yours sisters measurements. (measurements --> load individual) Make the layout and print. There is no need to make a copy of the pattern, just load your own measurements back if you need it. You will then use the program SEAMLY2D and open your pattern file. If you open a pattern that you have used before, look at the top of the window to see what measurement file (.vit) is being used. If you want to use a different measurement file with the same pattern, go to the top menu and select Measurements - Load Individual. That should pop up a window to let you select from the measurement files you created with the SEAMLYME program.